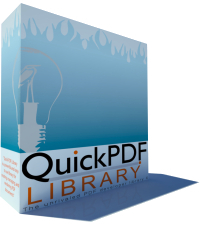 Quick PDF Library is a powerful royalty-free PDF developer SDK used by thousands of developers for working with PDF. It is a robust API with over 500 functions for use with C, C++, C#, Delphi, PHP, Visual Basic, VB.NET, ASP, PowerBASIC, Pascal and more. Quick PDF Library is the ultimate toolkit for a project where you need to create, edit, secure, print, render, split, merge or manipulate PDF documents. The library is available in ActiveX, DLL and Delphi editions. Single or multiple developer licenses can be purchased and a source code license is also available. Simple and fair licensing. When using our library you won't have to worry about how many CPUs your server has or how many desktops your application will be installed on because we don't care (well, we care out of interest, but we won't ask you to pay more!). Royalty-free, reasonable pricing (for one or multiple developers) and no annual fees. Qweas is providing links to Quick PDF Library 7.19 as a courtesy, and makes no representations regarding Quick PDF Library or any other applications or any information related thereto. Any questions, complaints or claims regarding this application Quick PDF Library 7.19 must be directed to the appropriate software vendor. You may click the publisher link of Quick PDF Library on the top of this page to get more details about the vendor.